Opo squash is stir-fried with onions and bell peppers, then simmered with Thai curry and coconut milk. Thai Curried Opo Squash and Peppers is a perfect side to go with your favorite Asian-style main dish, and ready so quickly! Have you ever heard of opo squash? I certainly had not! 😯 However, I am a curious cook, and when I saw it at my local market, I knew I had to try it. Thai Curried Opo Squash and Peppers is one of my recipes that was an experiment, and I’m always relieved when my experiments work well… I mentioned this obscure ingredient in my last post – Thai Curried Snapper in Banana Leaves. We prepared them to have alongside our fresh gulf snapper and Coconut Rice. Opo squash, with its mild flavor and low calorie count, is a healthy and versatile vegetable. The Chinese stuff and then steam or bake them. They can be cubed and added to stew and sliced for a stir-fry. They pair well with bell peppers as in my Thai Curried Opo Squash and Peppers. If you are unable to find opo squash, substitute zucchini, yellow squash, chayote, summer squash, etc. This dish pairs well with my Thai Curried Snapper in Banana Leaves for the simple reason that it utilizes the marinade left from the fish. Peel the squash, slice lengthwise, and scoop out the seeds (if necessary), then cut thin slices – about 1/8″ to 1/4″ at most. I did NOT find that my mandolin worked well on the somewhat spongy texture of the squash. Slice the onion and bell peppers. Stir-fry the vegetables in very hot coconut or vegetable oil, add the sauce/marinade, give it all a good stir, then cover until the vegetables are tender. The vegetables should be completely cooked in about the same amount of time as the steamed fish! This dish is so simple. Even if you’re not marinating fish in curry, you can whisk the sauce up in under 5 minutes! 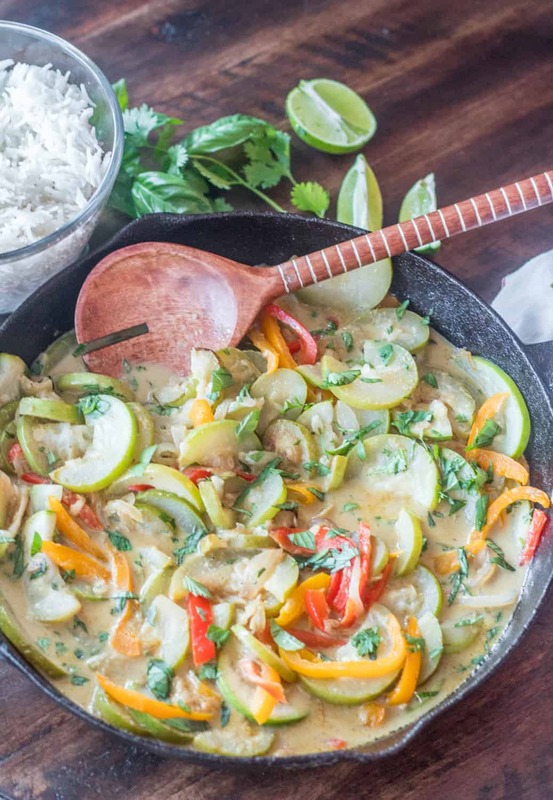 Thai Curried Opo Squash and Peppers is delicious alongside chicken satay and grilled fish. 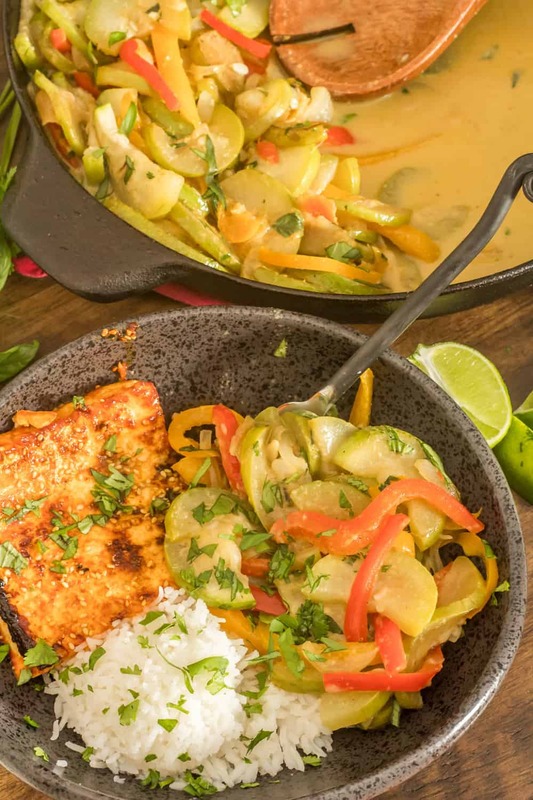 A favorite #meatlessmonday meal at Andersen casa pairs this dish with jasmine rice and a marinated and seared tofu slice! Keep in mind: To make this dish vegetarian, though, you need to substitute tamari soy sauce for the fish sauce. Of course you must have a scoop of rice to sop up the delicious sauce. Have you tried (or even seen) opo squash? 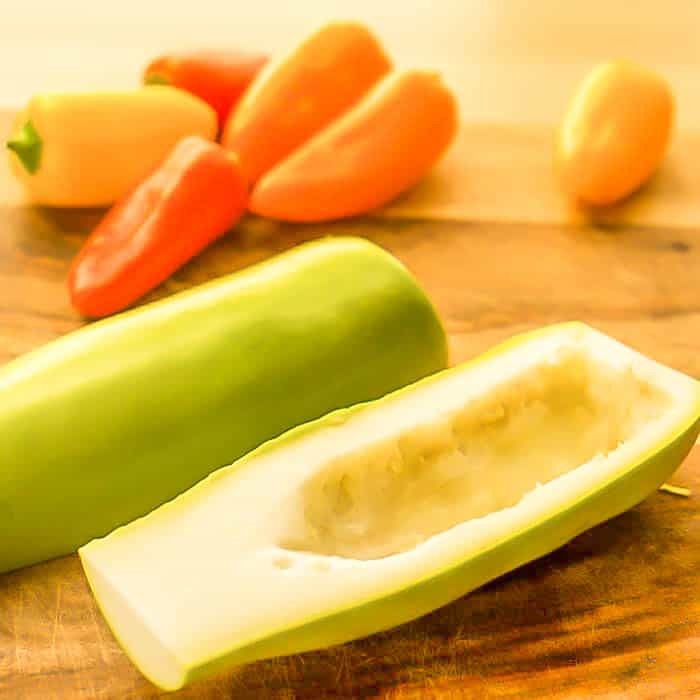 Inquiring minds want to know… If you like zucchini, yellow, patty pan squashes, I feel confident you’ll like opo squash! To a wok or large saute pan over high heat, add coconut or vegetable oil. When oil is hot, add opo squash. 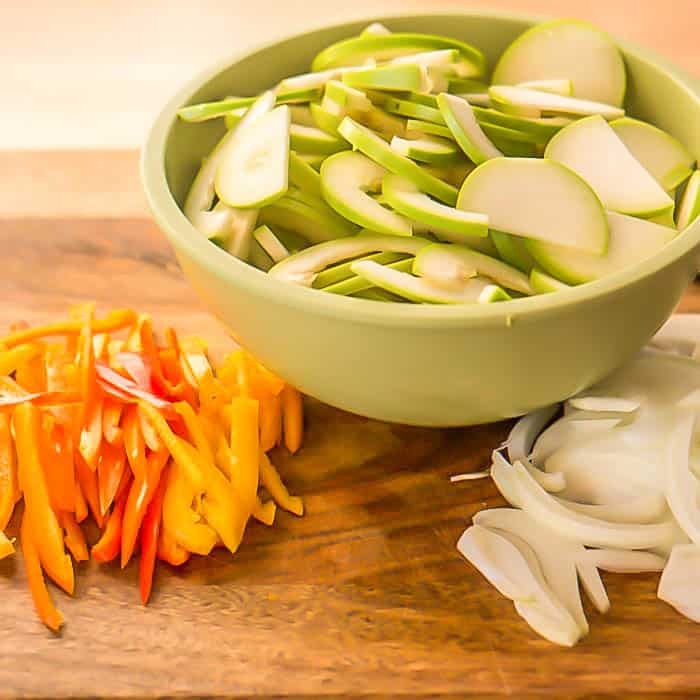 Stir-fry 1 to 2 minutes, then add peppers, onion, garlic, and ginger. Stir-fry another 1 to 2 minutes. Add coconut curry sauce (or remaining marinade), stir, and cover. Simmer just until vegetables are tender. Garnish with chopped cilantro and/or basil if desired. Make sure to check the smoke point of your coconut oil if using! Refined coconut oil can handle high heat. You may not be able to find opo squash. Substitute another summer squash variety, eggplant, sugar snap peas, etc. Be creative! 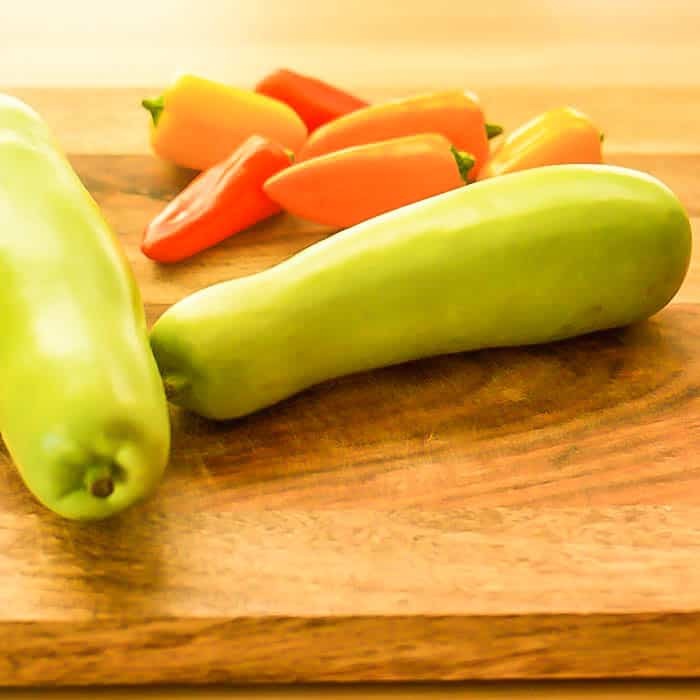 The mini sweet peppers shown in the photos are a perfect way to add lots of beautiful color to this dish! Use 6 to 8 of them. Most of the time, I use lite coconut milk to cut fat and calories. The choice is yours. Curry paste is hot! If you can't handle very spicy food, you may wish to start with a teaspoon or two, and add as desired. Curry paste recipes and prepared curry pastes vary greatly in heat level. I like to use brown sugar/splenda blend to cut calories. Always cut the quantity in half as it is sweeter! 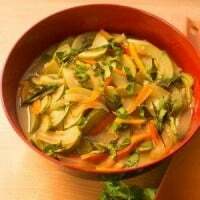 To make this a vegetarian dish, substitute tamari or a good quality soy sauce for the fish sauce. I love the flavors of Thai food. Fish sauce is not vegetarian. I wish you either find vegetarian alternate or reclassify this as non-vegetarian. Hi EG. I'm sorry that you are unhappy with this recipe. I am well aware that it is not vegetarian. I mention that fact in the body of the post, and in the notes in the recipe. I suggested tamari as a substitute. I included it in my "Vegetarian" category only because I explained that fish sauce is not vegetarian, but there is a decent (though very different substitution). Thanks for your comment. Love Thai food and these flavors look real good. I love making my own curry paste as well! I am now living in an area where I can easily get the ingredients :-) You'll have to be on the lookout for some pretty opo squash! I really like this warming and comforting meal! I have never heard of or had opo squash before, ibut it looks delicious! It also looks like zucchini. love the idea that you share recipes with unique ingredients. I do love to post recipes for unique ingredients, and always hope that doesn't make my recipes impractical :-) Thanks Neli! This looks delicious! I grew up not too fond of squash but I love it now, however, I've never made it myself. May have to give it a try. I am a big fan of Thai curries. This one looks very warm and comforting. It is warm and comforting, and so simple to make! Yum! I always love trying out new Asian dishes. I especially love your warning that "curry paste is hot!" I didn't realize its power my first time cooking with it, so the only way I could eat my curry was by taking a gulp of water with each bite! Haha! That very same thing has happened to me ;-) Thanks Sarah! I think I have seen opo squash in the market but I would have had no idea what to do with it! Loving this curry, Thai curry is one of my favorite foods in the world. It's somewhat similar to other summer squash varieties... I hope you give it a try Meghan! Love this recipe so warming and delicious!! Just pinned and stumbled! I think we have this type of squash here in our markets in HK but I do not know what they call it. I really love the new look of your blog since I last visited. Awesome!